Superstition is alive and well in the high tech world. It is visible most prominently in our technological artifacts, some of which we treat like medieval relics. Recently, supernatural superstition has crept into American treatment of 9/11. The genius of modern mass production was the machine’s ability to make cheap identical copies of any invention — unlike the uneven creations of mortal craftsmen. We figure out how to make a hunk of steel and then our factories made millions of hunks of it. We first make a typewriter prototype and then our factories made thousands, even millions, of identical clones of that typewriter. Yet, if a famous writer used one of these identical typewriters, than that particular typewriter is endowed with an unspecified specialness. For instance Hemingway’s personal typewriters (he had more than one) are treated like relics. They are roped off, no touching them, they’ve become the object of pilgrimages, fetching more than $100,000. Yet, the venerated typewriter itself is indistinguishable from other units made on that assembly line. The only evidence that the venerated one is Hemingway’s is external — you need to trust someone’s word that this particular ONE is it. Its specialness originates in the same way as an ancient relic — because someone says so. Is this really one of Hemingway’s typerwriters? Relics are common in all the major religions of the world. Islam venerates the sword of Ali and the staff of Moses. In Buddhism huge pyramidal stupas were built over tiny relic shards of Buddha, including his tooth. Slivers of the cross that Jesus was crucified on were widely venerated in medieval times. These ordinarily looking pieces of wood were believed to have magical powers because there were indirectly touched by Jesus. The only evidence that those bits of wood were touched by Jesus was someone’s claim passed along by word of mouth. The wood chip itself was unremarkable — even if it was from the actual True Cross. The logic of relics is supernatural. According to experts, the relic’s power is due to “the mystic potency emanating from the person or thing that is sacred,” a potency which in turn is transmitted to objects, and in turn transmitted to those who touch or see the object — or relic. This relic magic operates at full throttle in the world of modern celebrity collectors. The $3 hockey puck used in the 2010 gold medal Olympics championship game later sold for $13,000 because of the unique properties it acquired during the game. The baseball that Barry Bonds hit over the fence as his record breaking 762th home run was so eagerly sought after for its special properties that it sold for $376,000. But physically the ball was indistinguishable from any MLB baseball, which anyone can buy for $17. In fact, there are no special properties of the Bond’s home run ball, so much so that there was an elaborate ritual to mark the outside balls before the game so that one could establish the provenance of the exact ball used. Provenance is a key notion in relics and collectables. It establishes a chain of claims about previous ownership. Among believers and collectors there are often arguments about the particular provenance of a particular relic. But there is never a question about whether there really is a specialness in the artifact if its provenance is true. Collectors of manufactured items used by the famous believe that their manufactured piece — out of all the similar pieces — really does somehow contain or emanate the supernatural or mystical spirit of the famous. It is as if fame or greatness is contagious. The special power of the athlete, or movie star, or artist is transmitted through two degrees of contact. But provenance itself does not explain why we assign any special meaning to the artifact, or to the clone. There is no non-magical reason why this clone is special just because a famous person touched it, or slept in it, or hit it. The pen used to sign the Declaration of Independence, or the guitar played Bob Dylan, or the ball hit by Barry Bonds, can only be really special if we assign these technological specimens supernatural magical contagious power. 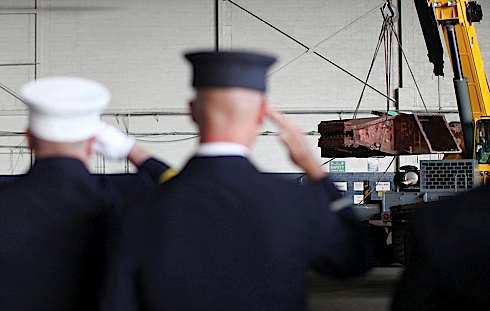 Mark of respect: Officers from the St James New York Fire Department salute inside Hangar 17 at JFK as a piece of steel from the World Trade Center is hoisted away. Almost 600 miles away in California, hundreds of people turned out to welcome a 9/11 relic brought back by seven members of the Brown City Fire Department. The scenes are likely to be repeated across the country in the coming weeks, as fire departments take their turn to bring relics home. However the rusting steel is just junk steel, the same rusty steel as any old steel beam sitting in a junk yard. It contains no discernible unique qualities. Yes, there is a long complicated and ritualistic chain of evidence to establish the provenance of these steel beams, encouraging us to believe that they somehow have special properties invisible to science. But they are indistinguishable from other bits of twisted, collapse, rusted steel. Let’s say some heartless jester swapped one of those steel beams with another one from a different collapsed building and sent the sister beam on parade around the country. Let’s say no one discovered the subversion. Would it make any difference? To many people it would. And not just because it was a lie. But because they honestly believe that artifacts can transmit the aura of a human who uses it. In this case, the steel transmits the bravery of the firemen rescuers, and the innocence of the civilians who died. But it can also transmit cooties. They believe that wearing Hitler’s sweater would be a bad idea, while sleeping in a room (completely remodeled) that Lincoln slept in is a good idea. This is magical thinking. There is certainly value in keeping old things. Museums that collect artifacts, like say the Computer History Museum, contain both original prototypes and arbitrary production-run units, and these contain great historical information and lessons. But it doesn’t (or shouldn’t) matter who touched or used them previously. Manufactured artifacts can’t be relics. They are all clones. Few of us are immune from this magical thinking about artifacts. Who wouldn’t keep their father’s watch, or mother’s necklace as a family keepsake, and somehow feel cheated if someone swapped it with an identical one from the same production line? It is not the same somehow, because the very one that your dad wore on his wrist, or your mom around her neck, must in some way contain something of them. Some intangible, spiritual, ineffable quality that would be absent in another unit. Of course, there is no difference, which is why we place so much emphasis on provenance (“it’s been in our family forever!”). In the end, a historical technological artifact is one of the reservoirs in the modern world where superstition still flows freely. “But it doesn’t (or shouldn’t) matter who touched or used them previously.” This comment depends entirely on whether it is superstition or nostalgia. In the case of nostalgia, it does matter, and probably should. Some, not all, nostalgia is superstitious. Interesting piece. Would you likewise agree that there is a great deal of superstition in the field of art? An effectively exact copy of (say) a Picasso painting could be made, which was functionally identical to the original. But it would be worth maybe one millionth of the original. What’s this all about? Seems to be related to bragging rights; if somebody can afford a real Picasso then not only are they rich, but also somebody with taste (?). @d726b94e727b79412f64850c34b90287:disqus My wife and I are South African. We were privileged to visit New York City for our 7th anniversary recently. While there, we went to The Met. It was a great experience, and wonderful to see so many famous and beautiful pieces of art and historically significant items. I found it amazing to stand in front of the exact, original works of such masters as Van Gogh, Rembrandt, Renoir and Picasso. I don’t think it’s about superstition, or anything like that, but rather an appreciation for and an understanding of the fact that many years ago, these people actually created these works by their own hands. To me it’s not magical, but rather very special indeed. If you later found out that all of them had been swapped with really good reproductions for security reasons, would it affect your experience? I think people are attracted to museums b/c they invoke a sense of preservation and culture. People that collect this art, for the most part, are interested in exclusivity. This is a function of the ego. Yes, there is lot of superstition about “originals” even in art. Nostalgia or reverence is not superstition. Most people know which they’re feeling. In the presence of historic artifacts, we achieve a more reflective state of mind. We reflect on the real significance of the events they represent. They carry no specialness with them, but rather create new meaning in each of us. The splinters of the cross are not at all like the 9/11 artifacts, Hemingway’s typewriter, the classic cars I keep, or the historic sites I fight to preserve. The latter all have real impact on us, no mysticism required. THis does take place with rare old things — a colonial building one wants to preserve. Rarity and age are real, and as I said, can be of value. But at the same time, we can assign value to things that are not rare — a base ball, or old model typewriter — that in themselves don’t have value, unless we allow them a story. We value the story and not the artifact. The story changes the mass-produced thing into a rare or unique thing. That’s real, too, not magical thinking. If we become more thoughtful in its presence, then its lessons are just as real as a thing there was only ever one of. Irrational, yes, but not magical. Your book makes a point of calling many things “technology” which are not widely considered as such (e.g language, law). Aside from the superstition component (which I agree exists) I think that these relics may be a form of old technology. We humans tell ourselves stories as we persue achievement or happiness or change, but often the effect of these stories is weak and shortlived. Therefore we must keep telling ourselves these stories about how great our lives will be when we have that new promotion (or relationship or gadet etc.) However, we have learned to use these relics to tell ourselves deeply powerful stories with both instant and lasting effects. This works by taking a significant story (Hemmingway, 9/11, princess diana) and putting us *in* the story. That’s why provenance is crucial, our rational mind must be satisfied or we won’t believe the story. But once we believe, the story can become vivid and emotionally compelling. The power is real, but not magical, it is psychological. We may not know the reason why such things should effect us, yet they do. I don’t see any signs that we are turning away from this antique but potent technology to hack our subconscious minds. I think you are right. We need stories. We are, in fact, as the poets say, not made of atoms but of stories. So we want the story that the previous owner has had with this object. We are in fact paying for the story and not the artifact. The artifact is incidental and could be unknowingly swapped without diluting the story. I think what you have missed is that establishing past ownership or association with a mass-produced object is not always left to the inexactness of provenance. People often physically alter the mass-produced item intentionally to establish ownership (initials scratched into paint or engraved into metal are a good example) and unintentionally as a result of wear. This is especially true in the case of tools. Many of the antique tools I use have intentional signs of ownership and all have unintentional signs. I don’t think that associating them with their past owners and users is superstitious. It is a source of contemplative association that sparks my imagination. I have little idea who the previous owners were but I know we have the ownership of the object in question in common. I could make an argument from the opposite perspective. Observing first-hand how unremarkable these artifacts are can be a stirring reminder of the genius within the people who used them. The fact that Hemingway’s typewriter is identical to many others forces us to concede that the brilliance was contained entirely within the man; that he had no magic tools. Indeed. But then why would you pay $1000,000 for it? My question is, what happens 50 or 100 or 200 years from now, if and when we get to the point of being able to manufacture exact, atom-for-atom copies of objects? This is not that far-fetched, it may be essential for pushing things like computer technology to their theoretical limits. I think Mocky Habeeb has the right idea- that collectors are paying to be part of a great story. But what if it were impossible even in principle to know which artifacts were genuine- to the point that it is not physically meaningful to pose such a question? Would collectors still think owning the object made them part of the story? Or maybe it would set an upper bound to the price of an original, since beyond that price you could make as many originals as you wanted? In that situation, I would — maybe not salute, but certainly watch quietly and reverently as the 9/11 site was cleaned up. It’s an important part of our nation’s political and social environment, it’s (like it or not) a significant event in all of our lives, and it deserves a few moments of contemplation. Not for the sacredness of the artefact or the site, but to help ME find my place in this world. I would argue that firefighting is a sacred PROFESSION. And if firefighters want a piece of the twin towers in their stations as a reminder of the importance of their profession, and what they might be called to do, and why… I think that’s perfectly legitimate. The problem is not the relics PER SE, but our tendency towards idolatry. As a reminder of important people, ideas, or events, all of that is perfectly reasonable: I want a watch that reminds me of my dad, not one that reminds me of my dad and how I lost his watch. It’s when we think it’s something inherent in the item that we go wrong. The reason why fiction is so important is it’s ability to detach a person from the cultural artifacts of everyday life. Right or wrong, most people have an emotional attachment to the things around them and it should be no surprise that a piece of wreckage from 911 will evoke a significant deep felt response in some form. Fiction helps people see the world with new eyes since it allows a person to engage in a world where there are no known cultural artifacts in which a person already has a strong non-wavering opinion on. The goal of good fiction is not only to take a person away into a new world, but when they finish reading the book or watching the movie is for them to see their own world as if it’s a strange new land. Superstitions assert that external objects or rituals can confer or exert power upon an individual. A rabbit’s foot brings good luck. A broken mirror brings bad luck. A “lucky” putter confers accuracy on the green. The ritual of knocking the dirt off your cleats confers home-run hitting power. Heirlooms and collectibles are a little different. 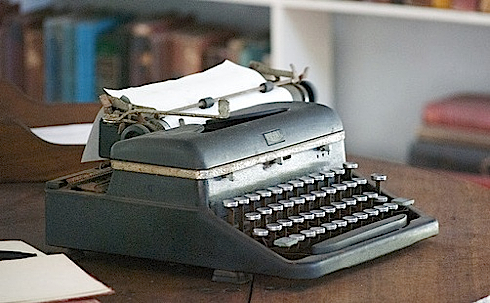 Possession of a famous author’s typewriter may confer literary talent – to the wishful mind. But for most people, the ‘act of preservation’ holds more significance than the object itself. Preservation is a declaration of our values, affections and loyalties. Possession of replicas make the same kind of declaration, but (as noted) in a less satisfactory way. The act of crafting a replica – of an historic sailing ship for example – is held in higher esteem than the mere possession of one. When the originals have disappeared, creating a replica is an act akin to preservation. The World Trade Center site is essentially a historic battlefield. But unlike Gettysburg, the site is too valuable to be preserved in the manner of the Genbaku Dome at Hiroshima or the Kaiser Wilhelm Memorial Church in Berlin. The Ground Zero relics were originally circulated to prolong the nation’s feelings of grief and outrage. They were paraded in distant communities, far from New York, to bind us to a common national crusade – for “Justice”. Yet, the bulk of the WTC steel was sold to China as scrap. There were some hard feelings about that. But hundreds of steel fragments are now displayed in museums, fire stations, city parks and military bases all around the country. Thousands more must be in private collections. Their purpose now is to honor courage and duty… and to serve as cautionary symbols. Again, it is the act of preservation that is valued, not the material of the objects themselves. Collectors will pay millions for the privilege of serving as a “custodian” of a piece of history. It is not just preservation. Otherwise the price of Hemmingway’s typewriter would not be more than the price of the same make and model that Hemmingway did not use. The price of those antiques reflect the act of preservation. The fact that people will pay more for Hemmingway’s indicates something else is going on. Yes indeed, the purpose of relics is to honor. But even though the slivers of metals that they honor could be substituted with “orindinary” metal, the venerators would be very upset if they were substituted. They would not be able to tell whether it was ordinary water, metal, wood, or whether it was holy water, metal or wood. The only way they could know whether the 9/11 metal being paraded through the streets was really 9/11 metal is if they believe those who claim it is. Whatever power the metal has is not in the metal but in the claim about the metal. That is what I call superstition. I would recommend “Supersense: From Superstition to Religion – the brain science of belief” by Bruce Hood. This book investigates the psychology of supernatural believes. The author traces the origins of supernatural beliefs to how our minds develop when we are babies and children. “The logic of relics is supernatural… mystic potency emanating from the person or thing…”Science may yet show there’s nothing supernatural or mystical about this. Some of the more interesting “conceptual art” plays with this, e.g., http://www.medienkunstnetz.de/works/transsib-prospekt/ . 95% of “art”, these days, is essentially garbage that has been put on display in a museum and had the status of art bestowed upon it. That makes a lot less sense to me than the preservation of relics – we don’t even have “superstition” as an excuse. As a culture, we enter into a group agreement about the value of a specific thing. We establish rituals and a set of emotional markers that we use to indicate that we have entered into that agreement. As already noted, this agreement (the “story”) has importance outside of the market value of a thing. By agreeing (to some level of accuracy) on the value of one “special” instance of a manufactured object, we desire not to bask in its presence, but to become participants in its story. The hypothetical act of replacing some artifact with an exact duplicate would indeed be important to me, because it could only be done in the context of the story. Our imaginary trickster would be making a statement, not about the object itself, but about either the story (and thus becoming a participant herself), or about our desire to participate in it. Calling the story “superstition” places you, Kevin, firmly in the camp of those skeptical about (or perhaps wary of) the importance these stories accrue. Some stories, after all, are dangerous. In this sense, I think it is meaningless to speak of an artifact being “unknowingly replaced.” Either somebody knows (and has thereby changed the story), or nobody knows (which, by definition, cannot change the story). Last of all, I think the statement “Manufactured artifacts can’t be relics” is either muddled thinking, or clumsy diplomacy. Your essay seems to strike at the idea of what a relic IS (cf. “special properties invisible to science”), not at the notion that only some objects can be relics. If nothing can be a relic, then this post is not really about technology. If some things can and others can’t, this can only be by group agreement, which turns out to be whatever we say it is. Thanks for the interesting info! Your article sparks thoughts about the nature of objects, the characteristic of uniqueness, and assignment of value. While I generally agree with the notion that naive superstition drives the value of relics, aside from making a bit of controversy, I don’t find Hemingway’s typewriter exerting any mystical powers. Nor have I ever heard any claims about any mystical powers. Indeed, that object has no magic. If it’s not magic, what’s going on? I think it’s instructive to swipe a couple of notions from Bruce Sterlings taxonomy— artefact (objects made by hand, and powered by muscle) and products (mass produced objects indistinguishable from one another). You observe that Hemingway’s typewriter is an object identical to many thousands of its identical brethren. It is a product. But what makes it special? The fact (evidence? assertion?) that Hemingway toiled at that machine turns that common object into an artefact. The added value comes to this object through context. In the context of Hemingway’s other possessions, it tells something about the man, the place, and his writing practice than words or a photograph alone. Markets assign value by the action of independent agents acting in their own interest. A collector of Hemingway artefacts might well value common objects disproportionately. Other collectors might agree, or disagree. Their agreement or disagreement over price is what sets the value. Their collective judgement sustains or dismisses claims of authenticity. These transactions in no way turn the object into something magical. You assert that “many people” and “they honestly believe that artifacts can transmit the aura of a human who uses it” Who are you referring to?!? What evidence you have for this assertion? The evidence that I have suggests that people who sleep in the Lincoln bedroom are not gullible superstitious rubes. They’re donors who contributed to the campaign to elect the President of the United States. The magic they seek is proximity, access, and the opportunity to influence the living President. But provenance is a very interesting concept, and I think it might be the salvation of publishing. In my world, few are interested in keeping objects like books that are identical to any other and easily replaced by an identical physical object, or verbatim delivery of data. But I do confess that I find it interesting to own a first edition. I think it would be great if books were somehow able to keep a record of their own provenance, like chop marks on a chinese scroll. I would be interested in owning objects with a history, that could tell the story of where they’ve been. I’d probably buy many more of these objects with a past. Not for the magical value, but for the story they tell. In a speaking about the “aura” in mechanically produced artifacts used by someone famous you say, “The added value comes to this object through context.” I agree. But it is not being carried by the object itself, but outside of the object. In that case the object could be replaced with a clone of itself, and the value would still be there since it is outside of the object. The object would remain as valuable as it was felt as long as one BELIEVED it was not a clone. Therefore that belief strikes me as superstition. Also, by the president’s bedroom I meant not the white house but the many other rooms n the US tagged “President X slept here.” Or Elvis slept here. It has little to do with access to influence and more with absorbing some intangible thing from the famous. An object can be famous without invoking magical endowments, no? In the way that a Islamic relic signifies God, isn’t Hemingway’s typewriter more a relic to Art than technology? Back in 2009 Cormac McCarthy’s Olivetti Lettera typewriter sold at auction for $254,500. It was only expected to go for ten grand or so. Cormac replaced it with another Olivetti that a friend bought for him. The friend paid eleven dollars for it . . . . . . Manufactured items are only clones when they come off the production lines. Once released in to the world they get the signature of their owner’s handling; the scratches, dints, chips etc that make it unique, and it is this handling that carries the collection of unique traits of the person who owned it. The value of these relics is in the way they make the collector feel. Irrational, yes to the rest of humanity, but not to the collector who is the only person who can feel how he feels. Superstitions exist only when you believe in them!